CNN interviewed Anke Hoeffler on the global cost of violence. The news feature was based on a new report by James Fearon and Anke Hoeffler that estimates the annual costs of violence at around $9.5 trillion, which is about 11 per cent of World GDP. 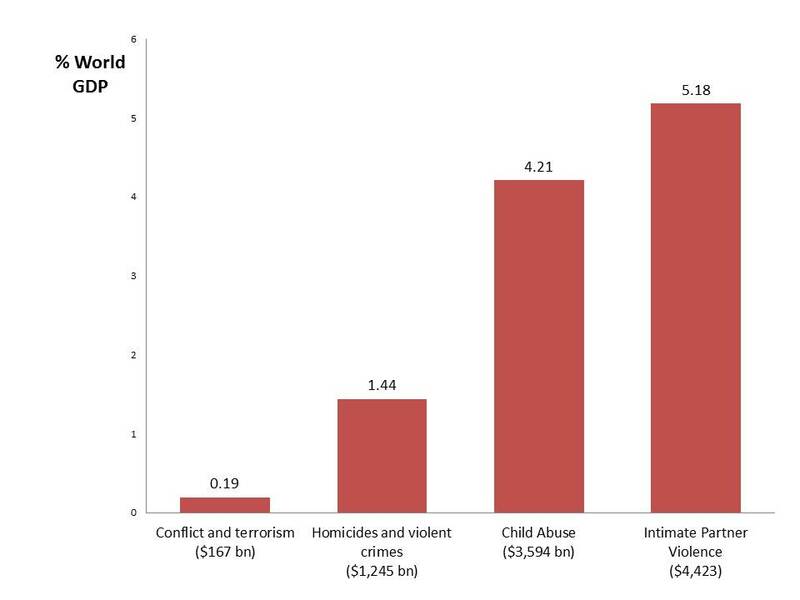 In their study they consider the costs resulting from civil wars, homicides, assaults and violence against women and children (figure 1). The high prevalence rates of violence against women and children make it the most costly type of violence; about 85 per cent of our total cost estimate is due to violence against women and children. The authors argue that the post-2015 MDGs should include targets on violence reduction. While a world free of violence may be an unrealistic target, the world is now more peaceful than at the end of the Cold War and some countries (such as the US and the UK) have seen a reduction in some forms of violence (homicide rates, intimate partner violence) over the past 20 years. Ambitious targets and programs for public health problems, such as the eradication of small pox, Rinderpest, Guinea worm, polio and measles have been very successful over the past six decades. As advances in medical science have resulted in a decline in deaths from communicable diseases, social causes of death, such as violence, have become relatively more important. The report also highlights that almost no development aid is spent on the prevention of violent crime (only about 0.27 per cent of total aid spending). The little aid that is spent on the improvement of judicial systems and police performance is mainly spent in post-conflict countries. Setting violence reduction targets would acknowledge that the global agenda is evolving and would promote research in finding ways to reduce violence in low and middle income countries. The authors argue for moving beyond a near-exclusive focus on civil war violence – concern with which has increased in the development community and is admirable and important – to recognizing that the costs of interpersonal violence are probably much larger but are almost wholly neglected in current development programming. This entry was posted in Uncategorized and tagged civil war, Conflict, Development, Electoral violence, Political Economy, Violence, War. Bookmark the permalink.